Scary clown sightings aren't news for most of us anymore, but there are a few implications and consequences of this craze that aren't a laughing matter. The scary clown hysteria stems from a couple of incidents in mid-late August. The first was a report of a man in a clown costume and black and white make-up wandering the streets in Green Bay, Wisconsin. This report was later confirmed to be a marketing ploy for a short film being produced in the area. In light of this, however, pictures of this clown went viral and were shared thousands of times. 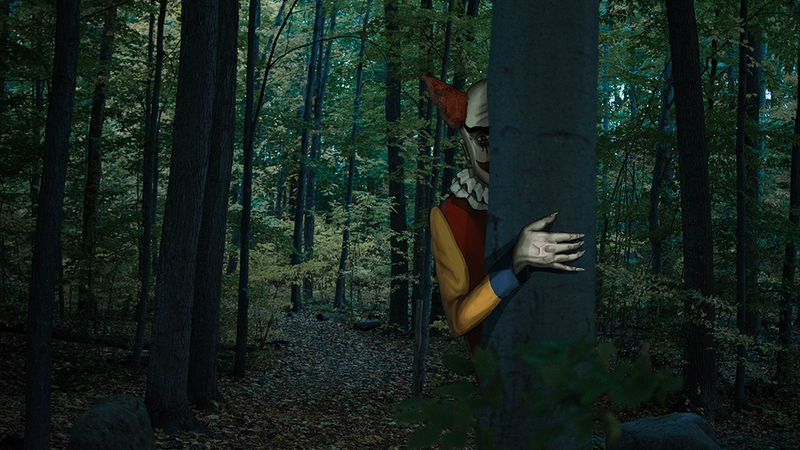 The second incident was made public in a report made to the police in Greenville, South Carolina regarding clowns in the woods with laser lights trying to lure children with money. While many of these sightings were not confirmed by authorities, the impact was made: police spent many man-hours patrolling the areas where clowns had been reported. "Criminal justice resources and law enforcement resources [are] being diverted to these calls, so the harm there is that’s a distraction away from the real needs of law enforcement," said RIT Criminal Justice professor Jason Scott. After the initial pair of incidents, the clown craze went viral and was termed "The Great Clown Scare of 2016" by The New York Times. The fear spread from state to state, and there are even viral posts circulating about which states have reported threatening clowns: more than 40 states have been affected. Whether or not these reports have been confirmed is another story. The main target of the would-be demon clowns seems to be school children: there have been numerous reports of clowns calling school offices and threatening to terrorize schoolchildren. The line between fun prank and law violation is becoming blurrier in those situations, but there can be real consequences from these threats. "People might think ‘Oh this is just a prank, this is just fun,' until the police show up and say 'Your behavior is consistent with a violation of disorderly conduct, and therefore you’re going to be issued a ticket,'" said Scott. As for the people who call in fake threats, Scott stated that there could be an even more serious penalty. "Those individuals can be prosecuted under filing a false criminal incident, which carries punishment as high as a misdemeanor or felony," he explained. In the Chicago area, a high school student making threats as a clown via a school computer was arrested. The student was reportedly threatening to follow students home from school and slit their throats, which is increasingly more violent than the original clowns that chased or simply stared at victims, and the student ended up being arrested. Seemingly funny pranks like this one can end in extreme consequences. Similar situations to the student in Chicago have popped up all over the country leading to 12 arrests as of the end of September. Those who were arrested face charges for false reports or threats or chasing people, according to The New York Times. It seems as though after the original threats went viral, many people — especially high-school aged students — thought the trend was a good idea for a prank; they failed to understand the line between prank and crime. "This has, in most part, been a social media phenomena," said John Helfer, the public information officer of the Monroe County Sheriff's Office. "It has been propagated by the media choosing to cover the story." "Stress, anxiety, depression, suicide, substance abuse, sexual assault that goes unreported. ; These are sort of the big issues, and if people are running around hysterically concerned about clowns, I would say that the harm is that we’re taking our focus away from the real issues." Sightings and reports of clowns have been surfacing in New York City as well as closer to Rochester in places like Greece, Fairport and Buffalo. In Greece, a video was sent into 13WHAM of a clown walking down West Ridge Road and waving at people in their cars after many unconfirmed reports of clown sightings in the area. Multiple false reports have been reported in Fairport; the Democrat and Chronicle and the Fairport and Attica police departments have reported no activity there despite the rumors. In Buffalo, multiple calls were made to the police department regarding someone wearing a scary clown mask. A video later surfaced of the clown and a group of friends bragging about scaring people in the mask. In New York City and New Jersey, the sightings have been more numerous than those upstate. Some "clowns" trespassed on school property and called in threats to children like in many other states across the country. Some incidents have become more violent than others, as well. A clown reportedly chased a teenager getting off the subway by getting in the doorway of the train and running after the teenager when they broke free. The clown wielded a kitchen knife while chasing the teenager around the station. Despite all of the sightings and reports, there has been limited police activity. “To my knowledge, deputies have not responded to any clown call for clown sightings," said Helfner. The discrepancy here lends itself to the idea that "creepy clowns" may be more of a social media phenomenon than an actual threat. "It may be a distraction from the public away from real issues, right? So what is the risk of someone being stalked by a clown?" asked Scott. "I would say slim to none. On this campus, what are real issues that affect students? Stress, anxiety, depression, suicide, substance abuse, sexual assault that goes unreported. These are sort of the big issues, and if people are running around hysterically concerned about clowns, I would say that the harm is that we’re taking our focus away from the real issues." With so many people copycatting the prank, there is no surprise that the creepy clown craze has infiltrated RIT. On October 5, a Reddit user reported seeing a clown behind Ellingson Hall. Public Safety was supposedly called, according to the Reddit thread. However, Chris Denninger, director of RIT Public safety, reports no such thing. "No reports [of the incident are] on file," he said. "There have been no suspicious clown sightings or reports in Henrietta per the Sheriff's Office." Users on social media have addressed self-defense in the face of "creepy clowns." People wonder at what point they can hurt a clown if they feel threatened. If you are to find yourself in a situation where you might see a clown, it is important to know that legally, you can't walk up to something that looks like something that scares you, punch it in the face and then call it self-defense. On the other hand, if a clown is threatening, has a weapon, chases you or attempts to harm you in any way, there are things you can do. Denninger highlights that if a student feels uncomfortable, they should call Public Safety. "This goes for anyone who feels they are being followed," he said. "Public Safety will investigate all suspicious behavior." Even with this advice, it should be known that it is not very likely that you will be chased around campus by a clown, especially since the hype has been dying down — along with the copycatters. Still, with Halloween coming up, it is important to remember that you can take safety precautions in this or similar situations. It is important to know that legally, you can't walk up to something that looks like something that scares you, punch it in the face and then call it self-defense. Denninger gives this advice for any student that is in a situation where someone is following them, clown or not: "Go to the closest public place where there are other people, call Public Safety (the number is 585-475-3333), and try to obtain a specific description of the individual," he said. Denninger also supported the use of the "Buddy System," and encouraged everyone to report suspicious activity because you're better safe than sorry. Scott also hoped that the "creepy clown thing" can be used in a positive light regarding safety. He argued that maybe this will help people remember to be a little more careful especially when walking alone at night. "That’s a risk that someone is putting themselves in and regardless of clowns, and probably even more so to other risks unrelated to clowns,” he said. While the actual existence of a clown on campus remains unknown, what is known is that the "creepy clown thing" has a serious propensity to infiltrate communities and scare large groups of people, whether or not a clown has actually been seen. Scott argued that communities can help deplete the hype in media reports and even on social media, perhaps helping with the fear of creepy clowns chasing people. “In general, I think that one thing communities can do is frame this in a level of accuracy; I have read news reports that have called this or characterized this as an epidemic," he said. "This is not an epidemic. An epidemic is widespread, it affects many people, and it has severe consequences. These are isolated incidents that are spreading because of the reality of social media. So I think being honest and reporting things in an accurate way is one thing a community can do." As a phenomenon that started on social media and plays to some common fear of clowns, it is important to remember just that: it started on social media when a marketing ploy for a company went viral. It escalated quickly, perhaps even more quickly than things that are truly scary and happening in the world. “My frustration is that there are underlying real social problems that always exist but are never really addressed, and as a society we try to get our minds off it with distractions that aren’t real threats," Scott said. "That's my biggest concern." "These are isolated incidents that are spreading because of the reality of social media." So what is to come of the creepy clown thing? Scott argued that one thing to remember is that society as a whole has a short attention span and will be off on the next craze sooner rather than later. “The best thing to do would be to stop talking about it and let's ignore it. Get off of social media and the clowns will go away,” he said.